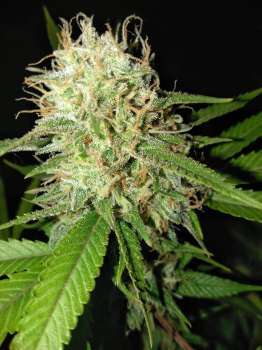 Here you can find a strain description about 859 Granddaddy's Blue Cheese and also some user-based reviews and infos directly from the SeedFinder (if available). You can also find the offers and auctions here if 859 Granddaddy's Blue Cheese cannabis seeds are on stock at MyCannapot right now. 859 Granddaddy's Blue Cheese (Blue Tahoe Cheese F4 x Granddaddy Purple F2) is a mostly indica hybrid (80% indica /20% sativa). This dank strain boasts a high THC level and a soothing mix of cerebral and body highs. With effects like a warming body buzz, mind relief, sleeplessness, and hunger, this strain was made to chill you out while still leaving you functional. With a delightful grape-ish cheese smell and taste, this strain is perfect for the patient who prefers a different taste. Good for chronic pain, stress, and depression. Also good for PTSD. Flowering period is 8 to 9 weeks. Buy 859 Granddaddy's Blue Cheese now at MyCannapot! There are no actual running auctions for 859 Granddaddy's Blue Cheese right now.